What if there was a way to cure the undead? What if that cure was a burger-flinging gamer wearing a VR headset and sitting in the back of a food truck? It seems that living corpses are making their way into anything and everything anymore, so PixelJunk VR Dead Hungry combines a frantic cooking game with, what else? Zombies. Instead of feeding the rotting masses their traditional preferred meal of brains or human flesh, you’ll be crafting artisanal food truck burgers that somehow cure the horde and let you live to grill another day. 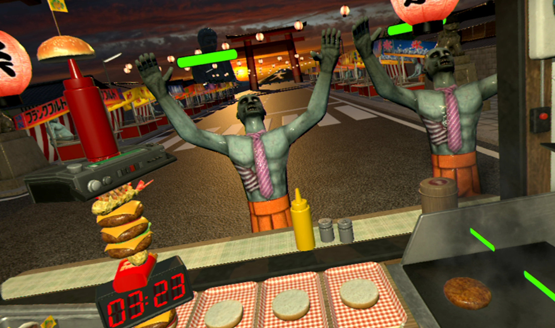 A wholly VR experience, Dead Hungry can be played with either the DualShock 4 or the Move controllers, but benefits heavily with the use of independent motion control. The DualShock 4 still uses motion controls, so instead of having two hands to fling burgers onto the grill, pizzas into the oven, and fries into oil, you’ll find multitasking severely hampered. Trust me on this. Use the Moves and you’ll have a burger-making resume the local McDonald’s will be proud of. 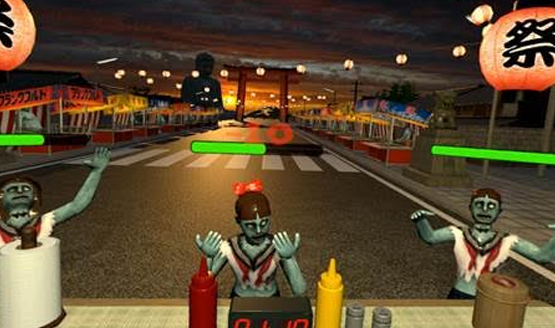 Outside the food truck, zombies slowly shamble forward, so you have to get cooking fast. Crazy combinations of burgers can be thrown together, from stacking meat and cheese feet high, to throwing an entire pizza into the middle, and even grabbing the light bulb above your head to use as a topping. Once the burger is ready, top it off with a bun and toss it to the approaching horde. If it’s worth enough points, the meter will drain and the zombie will become human once more. Take care of every zombie in the stage to complete it and earn a final score tally. At first, the frantic burger making was exciting. I love time management games like Diner Dash, and Dead Hungry immersed me in the role of being a cook for the dead, with the end of the clock being a big old zombie claw to the face. The challenge of managing toppings with what the zombies need to become human again becomes addicting. You could make a massive burger, but you might be wasting time making one huge one, when two burgers half the size could actually cure two zombies. This neurotic desire to create the tallest burger tower is actually what makes Dead Hungry difficult to manage. The shambling zombies simply have a green bar over their head. There isn’t a number attached in any way. As you build burgers, the label beneath them changes between a few words like “Weak!” or “Massive!” There’s no clear indication of how many points are required to cure a zombie or even how many points each burger is worth. Creating a massive stack for a fat zombie may have the intended effect of curing him, or it may have the effect of wasting a bunch of your time as he still has a fraction of health left and there are three smaller zombies coming forward without anymore burgers ready to go. Dead Hungry finds itself becoming a guessing game of making and tossing out random burgers to see if they’ll thin the zombie masses, instead of managing curated burgers to target specific point values or even “requests” from the zombies. Without the challenge of making specific items, the gameplay goes from a fun burger-flinging foodfest to a chore of repeated restarts because I overestimated the value of the burgers I was creating. 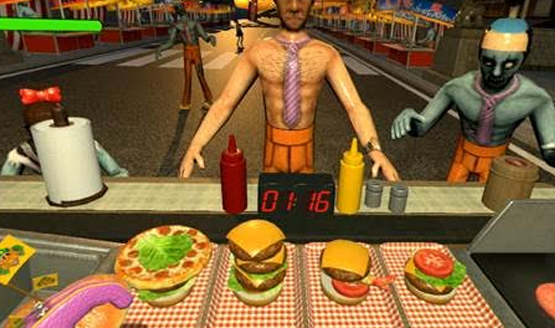 The gameplay never changes or evolves throughout; just requires players to make towering burgers with the same toppings and no specific goals besides netting lots of points. It doesn’t need to mirror every other time management Diner Dash-like game. The zombies don’t need to make specific requests like “triple cheeseburger with lettuce and tomato.” Simple changes could drive more compelling gameplay. Perhaps if point values were actively displayed for both zombie health and burgers being created, there would be a level of strategy beyond the guessing game. There’s rarely a worse feeling in Dead Hungry than realizing you’ve capped off a monstrous burger just a few toppings too early, only coming to that conclusion once the meaty delight is being wolfed down. Minutes of perfect burger cooking management ruined because there was no clear indication if the final product would be exactly what I needed or not. Every 10th stage results in a boss fight, an enormous zombie that requires an absolutley massive burger to cure. This again didn’t actually change how I played, because other smaller zombies still approach the truck. I just reserved one side burger to continually add toppings to for the slower boss, only finally throwing it out near the end once it gets to its maximum height. Though it should be noted that points are not based on the height of the burger. There’s some underlying system regarding the combination of ingredients that is never fully communicated to the player, and still leaves the entire thing a guessing game. Outside of the boss battles, the gameplay never changes. Occasional stages will have modifiers, like food that cooks faster, or zombies that walk faster, but the environments, enemies, and ingredients remain the same. There’s never a sense of advancement or progression. There could have been a whole economy, like using money earned to upgrade the items in your food truck to take on increasingly difficult stages (and make older ones even easier), but with Dead Hungry, stage one is effectively the same as stage 30. Random items can be earned by earning three stars on each stage, but I quickly discovered these are one-time use. Once they’ve been tossed into a burger, they are gone unless you decide to go back and get three stars on that stage again. There’s a really fun time management cooking game here, but without environment changes, kitchen upgrades, or additional toppings, Dead Hungry’s creative and frenetic gameplay quickly grows as stale as the flesh of those it seeks to feed. It seems like it would have been easy to add some kind of economy and progression system to the game, in addition to communicating what the actual requirements are, but instead we’re left with the value meal. The VR integration is fantastic, and the idea is sound, but the execution of this hectic time management experience hits the bare minimum requirements, rather than creating a compelling progression that begs for repeat play. Dead Hungry review code provided by publisher. Version 1.0 reviewed on a standard PS4 and PSVR. For more information on review scores, please read our Review Policy.